A small village in rural Ireland is turned upside down when a major Hollywood film studio descends to make a historical blockbuster on location. The story is told through the eyes of Charlie Conlon and Jake Quinn, employed as extras along with numerous other locals. As cultures clash, it becomes clear that Tinseltown’s romanticised dream of Ireland is a long, long way from reality. Just two talented actors brilliantly bring to life a multitude of extraordinary characters, ranging from the spoilt American starlet to the English director and the village old timer. Beverly and husband Laurence are throwing a party for their newlywed neighbours, Tony and Angela. Joining them is highly strung Susan who’s been banished from the party of her teenage daughter Abigail. Welcome to 1970’s suburbia and its heady mix of free-flowing cocktails, classic disco and cheese and pineapple sticks. As tensions rise and tempers flare the sheen of respectability is torn away by the warring couples with hilarious and potentially disastrous consequences. 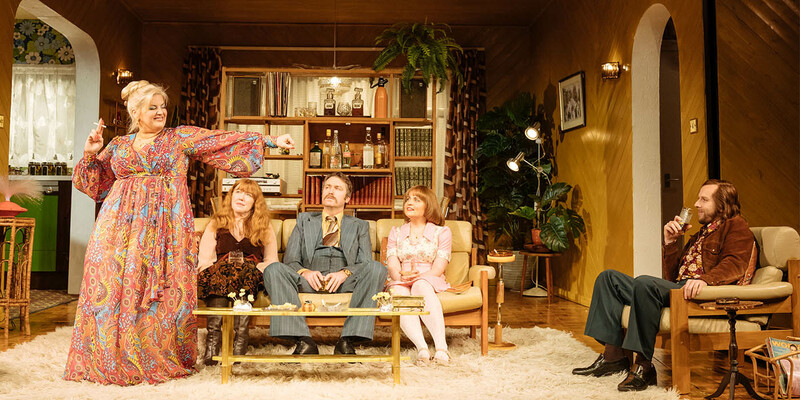 Mike Leigh’s iconic Abigail’s Party is one of Britain’s most celebrated comedies; beloved by audiences, it thrills and delights in equal measure. To book, visit: https://www.everymanplayhouse.com/ or ring 0151 709 4776. Abigail’s Party photographs by Manuel Harlan. Next Chemics Café: Free monthly dementia café open to anyone!